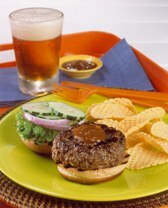 Make burgers by gently kneading together ground beef, 1 tablespoon hoisin sauce, 1 clove minced garlic, salt and pepper. Form into 4 patties. Prepare grill, or preheat broiler. While grill or oven is heating, make sauce. In small saucepan, warm sesame oil over low heat. Stir in 2 cloves minced garlic and onion pieces; cook until aromatic, about 2 minutes. Stir in 3 tablespoons hoisin sauce, soy sauce and Stout Beer. In small bowl, dissolve cornstarch in rice wine vinegar; stir into Beer sauce. Increase heat to medium; bring sauce to a simmer. Let bubble for about 2 minutes until well thickened. Set aside until ready to serve. Grill burgers to desired doneness. Place burgers on rolls; brush with sauce. Top with cucumbers and lettuce leaves. Serve remaining sauce on the side, if desired.